I created a Stock Portfolio Tracker 5 years ago that allows you to track your portfolio based on transactions and update their prices automatically. It has since become rather popular. You can check out my current portfolio, using this portfolio tracker here. To use it, you can tune in to the instructions here. There have been some developments recently, and I would like to update the people who are supporting this Google Spreadsheet. The first thing is that SGX have stopped allowing investors to use GoogleFinance() to get update to date last trading price information of their stocks. This affected many folks including myself who rely on GoogleFinance to pull latest stock prices. This means that you either have to rely on manually entering the prices on a frequent basis, or rely on Yahoo Finance. 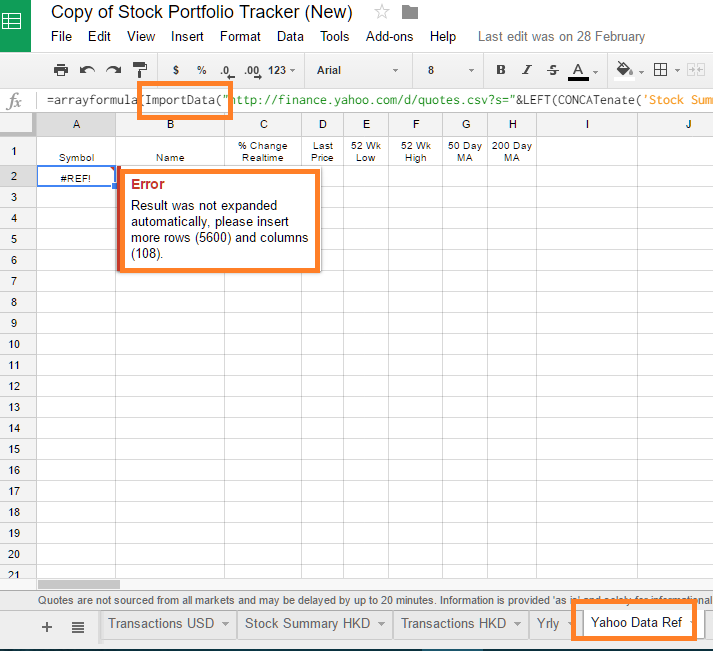 Prices at Yahoo Finance does work, it is just that the ImportData() function in Google Spreadsheet is having an issue. Update (2nd April 2016): As of today, I realize that it is partly a Google Spreadsheet issue, but also my implementation of Yahoo Finance issue. What you need to know is that, if you are using an existing spreadsheet, things will go back to normal. If you want it to be more robust, go to Yahoo Data Ref, Yahoo Data Ref USD, Yahoo Data Ref HKD. At cell A2, instead of using finance.yahoo.com in the formula, use download.finance.yahoo.com instead. If you really like the below implementation, you can go ahead and change it. I have incorporate some tips from users to improve the robustness. You will get a Result was not expanded automatically, please insert more rows and columns Error. This affects all the Yahoo Data Ref, Yahoo Data Ref USD, Yahoo Data Ref HKD sheets, which is where the stocks pull the prices from. I tried numerous ways and was not able to resolve it. So I decided to put a different implementation. I do not have time to think through this thoroughly due to some personal issues, but nevertheless this is my solution. For those who are new to the Stock Portfolio Tracker, you can make a copy of the Google Spreadsheet to start using. It will work. For those who are using the existing spreadsheet, here is some of my guide to how to get it working again. Instead of using Yahoo Data Ref, we will now download price data for individual cells. 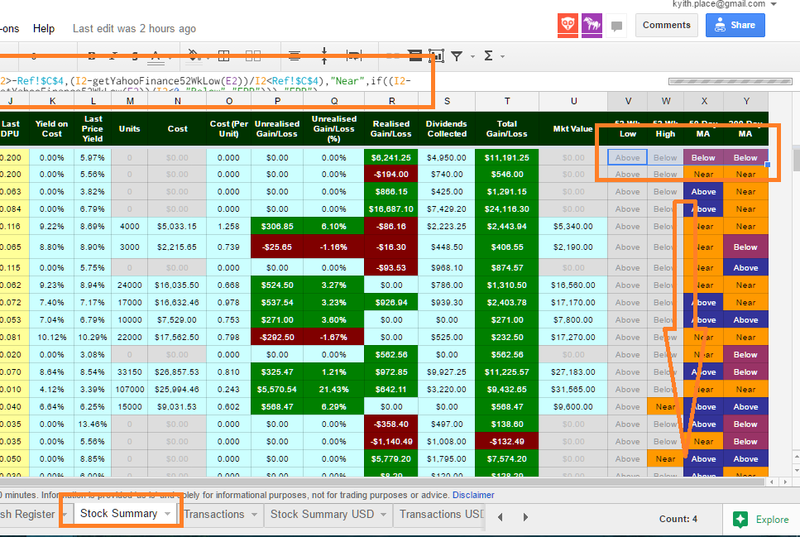 In your Google Spreadsheet, go to Tools > Script Editor…. You will come to this script editor. Then click on the Disk icon to save the functions in the script and then click on the Run button. Once you have saved the script, and click Run, you will be able to use the functions. Next Drag the bottom right blue box downwards to propagate the updated formula to all the rows. Do this for all Stock Summary sheets. Next we will do the same for the 52 Week Low, 52 Week High, 50 Day MA and 200 Day MA. Hope this solves your problem, and if you have a better implementation do let me know. Basically, the recent changes allow me ton continue using what has become a vital tool for me, so thank you. hey Alistair, so sorry for the late response. Did you get what you are looking for? I think yahoo moved to the second one and added a redirect at the first one to the second one. This seems to break the formula, but changing the domain name restores the function without so much effort. Thanks so much! you provide me with the best solution and even a causal explanation. I realize the old link now works, but i will incoroporate all this but also the script just in case folks need it. I have found a solution to it. the ImportData() function in new copy is back to normal, no error. Thank you very much. It seems this is part of a wider Google issue. Hopefully they’ll fix it soon. Thank you for the new solution. Hate it when they take away or breaks working features. hi JK! I been trying to find how to do this parsing! and i do not have the time to find this! thanks so much! but by chaining do you mean putting them in one line? Sorry i have not been coding long, perhaps u can give me a version. But for now it’s quite broken. If I copy the formula from A2 to A3, I can get the data populated. When I then clear A3, and double-click on the A2 cell, data populated as well. Anyway, thank for the new solution. Hi cm, I hope you have not change. Here is the fastest way. if you are using an existing spreadsheet, go to Yahoo Data Ref. Instead of http://finance.yahoo.com/d/quotes.csv use http://download.finance.yahoo.com/d/quotes.csv instead. It will fix the problem without so much changes. I love your Stock Portfolio Tracker and have been using it nearly the whole time I’ve been investing, for years now! Thanks again Kyith! Hi J, thanks a lot. Means a lot to me knowing it changes folks lives in little ways. For your information, the old method now works. seems really a google problem, but also a yahoo problem. if you are uncomfortable with it, you can revert the version history and use the old way. 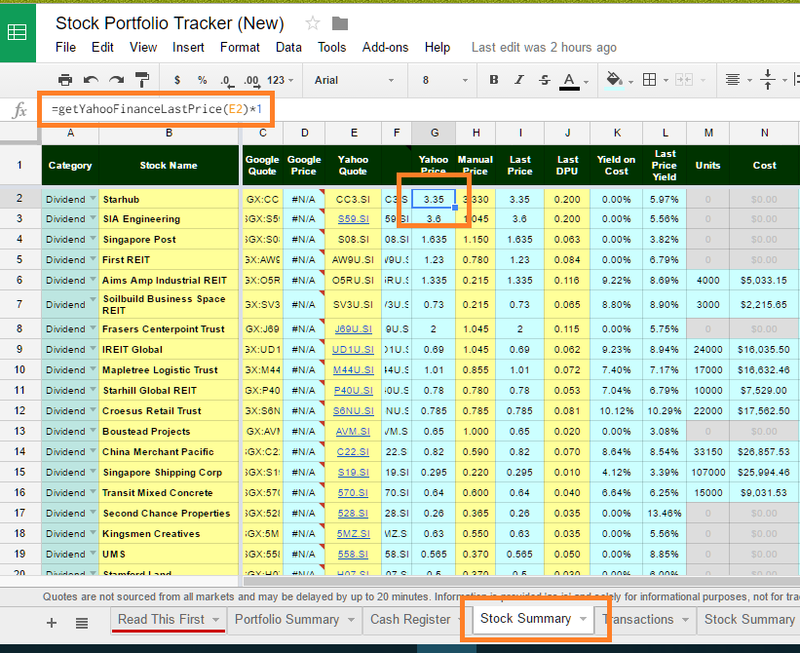 But this new method, reduces 3 sheets and can target stock prices on the fly. Hey Raymond, thanks for the great find! thanks Kyith and all the commenters above, this tracker has become an indispensable tool for me. I’ve been able to calculate my XIRR on individual stocks/ETFs (including dividends) to determine how they have performed individually – a great insight into what has worked and what hasnt – and where the opportunities lie! I tried to access the spreadsheet (with some self made changes) after not using it for ~2 weeks and now it crashes every single time I open it. Do you face similar issue? Hi HW, could you make another copy of your stuff, and see if it crashes? I have to make a copy of mine as well, cause the old one couldn’t even move. My spreadsheet crashed in FF but ok in chrome. any chance of pulling data of SGX? they got some good info there. Hi, How come “n” does not give the name of the stock, instead, it gives “#NUM!”? The problem might be > return parseFloat (value) . Here it tries to parse a string name and therefore likely will return an error. Perhaps you would want to remove the parseFloat and return only the value. This is awesome mate, been searching for something like this for ages. portfolio history is not updating, just has the data in there when i made the copy, What can i do to fix this? any chance you would know how to fix it? the portfolio history will be updated based on a script. Go to Tools > Script editor…..
You can use the drop down to find the function copyLivePortfolioDataToHistory(). Click on current project triggers, and set a timer of 1 time per day. Hi Joseph! thanks for the contribution. Let me test this out and let you know about it. How many stocks have you tried it on? I am able to get SGX Stock prices, thank you so much.. 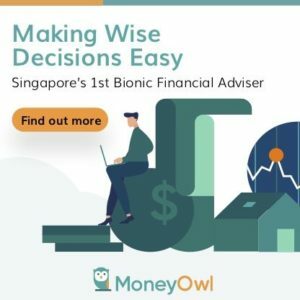 But I am unable to get the prices for Funds such as Schroder Asian Income SGD, First State Bridge A SGD, PIMCO Income Fund SGD (Hedged), etc..
Can you guide me through, please.